A liquid, neutral preventative agent formulated to prevent or inhibit the formation of performance-robbing scale or calcium buildup in the coil of hot water high pressure washer boiler coils. The formation of scale inside the coil acts as an insulator and prevents heat from the boiler flame from reaching the water, wasting fuel. In severe cases, scale can obstruct the water inside the coil, reducing the cleaning power of a pressure washer. 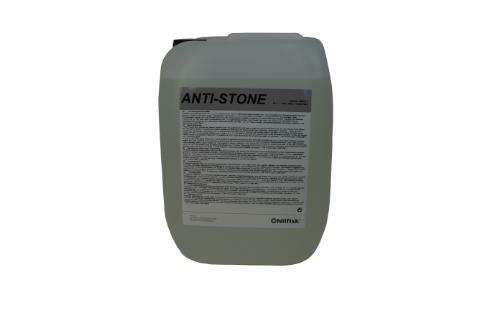 Continuous use of Anti-Stone, properly metered in a pressure washer, can completely prevent the build up of harmful, wasteful scale deposits. All Nilfisk hot water machines are equipped with adjustable dosing systems so they can be properly set for economical use of Anti-Stone depending upon the hardness of the water being used. Effective against: Calcium scale, Lime Scale. May prevent the buildup of scale from detergents not formulated for use in high pressure washers. Prevents or minimizes the buildup of scale inside a Hot Water Pressure Washer coil, reducing fuel costs due to heat loss (as would be seen in untreated machines). Maintenance costs can be reduced because the prevention of scale buildup also eliminates overpressure conditions seen with coil tubes restricted by scale buildup. Higher performance in cleaning operations, because backpressure is not created in the coil by scale buildup. Untreated coils can become completely blocked with scale (and especially when the water is ‘hard’). A coil which is completely blocked must be replaced… a significant, unnecessary, and avoidable expense. The product is suitable for use on machines used in a Food Processing environment, but water treated with Anti-Stone is not suitable for drinking. Anti scale solution for mobile and stationary high-pressure cleaners and comparable systems. In any Nilfisk High Pressure Washer, simply fill the Anti-Stone container and adjust the dosing valve according to your water hardness. (Instructions will be found in the machine Owner’s Manual for each machine). Even when water hardness is <10O DH, scale can build in the coil, but at a reduced rate. If your water is below this level of hardness, dilute the Anti-Stone solution 1:2 with water, and set the dosing according to the normal procedure.